Don’t miss the chance to engage in activities during Academic Internal Medicine Week 2019. Visit the Alliance Member Center, the hub for members to gather together and have fun, learn about member benefits, and hear the latest news from the Alliance. The Member Center is located in Exhibit Hall F of the Philadelphia Convention Center. 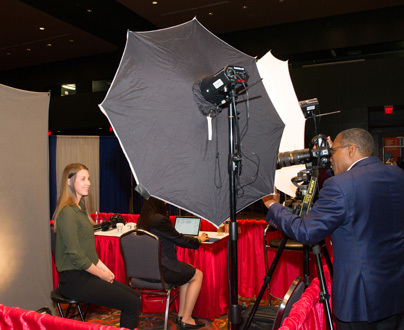 Update your professional headshot at the Alliance Headshot Booth. A professional photographer will be onsite to take your photograph for you to use on key networking sites, like your Alliance profile, at no charge. Grab some free giveaways and prizes! You can also drop off your Alliance IMfit game card and pick up the $5 gift earned by playing the game. Alliance IMfit participants are also entered to win a $250 Visa gift card! Chat with your association councilors and share feedback on your membership needs. You can also leave a written comment. Grab a cup of coffee while you recharge your mobile devices (and yourself!) in our comfortable seating area. Capture some fun moments in the Selfie Photo Station! Join us for a live Tweet Up from 1-2 p.m. on Monday, April 15. Pick up information about Alliance programs and resources and find out how you can get involved. Let loose and challenge your colleagues to some friendly competition in the Game On area! No time to sit in the Member Center? Grab an Alliance IMfit game board and have fun tracking your knowledge of the Alliance. Complete activities for the chance to enter to win a $250 Visa gift card! The more activities you complete, the higher your odds of winning! For five activities, you earn a $5 gift card! Look for the diversity, inclusion, and equity boards in the exhibit hall and convention center hallways and add a comment! Grab breakfast and participate in an informal discussion about diversity, equity, and inclusion in departments of medicine with your colleagues on Monday, April 15 from 7-8 a.m. in the exhibit hall. Look for the tables reserved for diversity, inclusion, and equity. Looking for a new career opportunity? Visit the IM Career Source Job Fair, located in the exhibit hall, and meet with employment recruiters. Meet your Alliance mentor in the designated Mentor-Meet Up section of the exhibit hall. Be social! 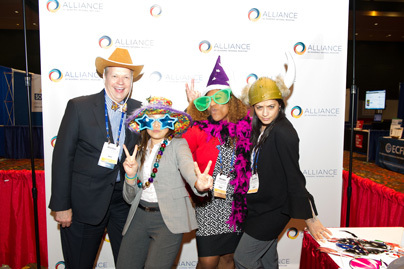 Take a photo in front of the Alliance backdrop and share it using #AIMW19! If you have any questions about the Alliance Member Center or other ways to get involved during Academic Internal Medicine Week, contact us at (703) 341-4540 or memberservices@im.org.